This stunning Grand Auditorium from our new Builder’s Edition collection features Hawaiian koa back and sides paired with a torrefied Sitka spruce top. The guitar was inspired by our groundbreaking V-Class™ bracing, which boosts the volume evenly across the tonal spectrum, increases the sustain, and improves the natural intonation of the guitar by creating a more orderly response from the soundboard. The result is a more harmonious relationship between the notes you play, helping chords sing with cohesive beauty. Another design emphasis of Builder’s Edition is enhanced playing comfort in the form of ergonomic new body contours. 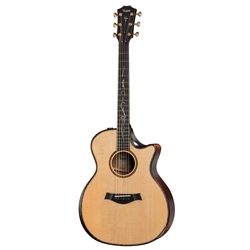 Details include a beveled armrest, beveled body edge treatment, and a reshaped cutaway that flows smoothly into the heel and incorporates a finger bevel where the cutaway meets the soundboard. This creates a more fluid path to the guitar’s upper-register notes for your fretting hand. Other refined touches include “silent” satin finish, which helps quiet the incidental noise against the guitar body, and a gorgeous new Kona burst that highlights the natural beauty of the figured koa back and sides. Inset koa/paua top and back trim adds a beautiful sparkle that complements the new Spring Vine fretboard inlay. In every way, this K14ce acoustic guitar embodies the ultimate player’s guitar and testifies to the benefits of innovative craftsmanship.